Not that long ago, if a conversation centered on heat pumps, it was fairly safe to assume that the equipment referred to ducted, split-system, electric, air-source units. That assumption started to change a few years ago with the growing popularity of ductless heat pumps. And geothermal heat pumps. And VRF systems. Now, there are multiple types of heat pumps available, including gas-powered systems and so-called magic box units, which contain an air-source heat pump to help improve IAQ. 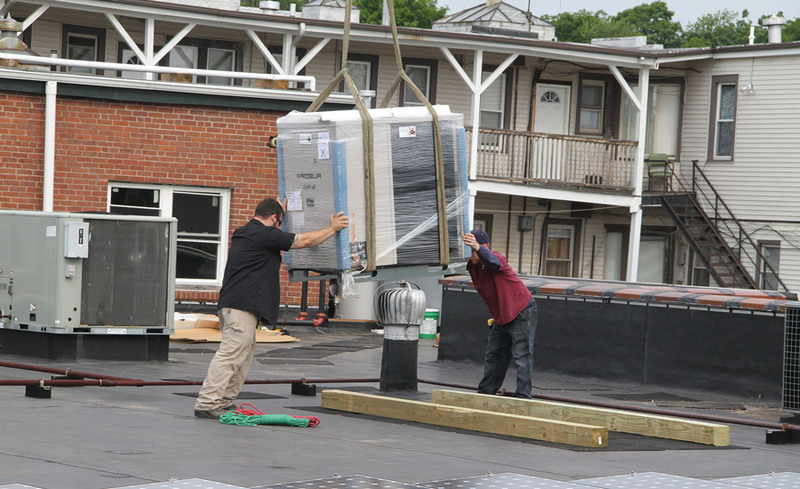 While these alternative units still comprise just a fraction of the heat pump market, manufacturers are hopeful sales will grow once end users and contractors learn about the benefits of the technology. Until recently, electricity was typically cheaper than natural gas, which helped create a strong demand for traditional air-source heat pumps. That scenario started to change a few years ago, when prices for natural gas began to drop. For Yanmar America, this meant the time was right to bring its gas-powered heat pump (GHP) to the U.S.
Robur Corp. and its parent company Robur S.p.A. have been in business for almost 60 years, perfecting gas-fired absorption cooling technology, which has resulted in both air-source and ground-/water-source heat pumps. With this technology, heat that is gained from an outside renewable energy source (air, ground, or water) is combined with the gas-operated absorption cycle of the heat pump, providing hot water at a very high heating efficiency. For cooling, the absorption cycle transfers heat from the indoor space to the outside energy source. The CERV is a demand-controlled ventilation (DCV) system that incorporates both volatile organic compound (VOC) and CO2 sensors for monitoring and controlling a home’s air quality as well as a heat pump for energy exchange between fresh-air and exhaust airstreams. “This exchange allows the system to deliver filtered, conditioned fresh air to a home rather than air that is not quite at comfort conditions, as in simple heat recovery ventilation (HRV) and energy recovery ventilation (ERV) systems,” explained Newell. There is one basic CERV fresh-air ventilation system, which consists of two dorm-refrigerator-sized modules. One module is the heat pump module, which contains the sealed system heat pump, and the second is the fresh-air module, which contains dampers for switching airflows from fresh air to recirculation modes as well as changing from heating to cooling modes. The fresh-air module also contains the CERV’s controller and all sensors (CO2, volatile organic compounds, indoor temperature and relative humidity, and outdoor temperature and humidity). Two insulated ducts connect the CERV to the outside — one for fresh air and the other for exhaust air. The fresh-air module is often stacked on top of the heat pump module, and insulated duct manifolds connect the two modules. Two additional ducts — an insulated house fresh-air supply duct and an uninsulated house exhaust duct — are also connected to the CERV. A thermally insulated filter box is placed as close as possible to the fresh-air inlet in order to keep the fresh-air inlet duct clean. When fresh air is required in the winter, the CERV first filters outside air to a level based on a homeowner’s MERV filter preferences (using a standard filter size). Fresh air is heated by passing through the CERV’s condenser section, and indoor air is exhausted at the same rate as fresh air is delivered for balanced ventilation of the home. Indoor exhaust air passes through the CERV’s evaporator section, where exhaust air is cooled and moisture is condensed. The combined sensible and latent cooling energies combine with the compressor’s energy and are delivered as heat to the home, with delivery temperatures averaging 85°-95°F. During the summer, the CERV operates in a similar (but opposite) fashion, with a fresh-air cooling/dehumidification mode and a recirculation cooling/dehumidification mode. “The CERV’s intelligent algorithms also determine when outdoor conditions are nicer than indoor conditions, allowing it to operate in free ventilation mode, where the heat pump is not activated,” said Newell.